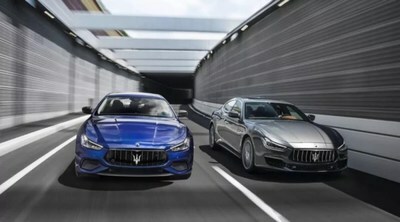 SHANGHAI, April 24, 2018 /PRNewswire/ -- Maserati, a leading luxury car brand and icon known for its elegance, style, and performance with a long heritage, happens to be a forerunner in adoption of emerging technologies to perfect the customer experience and to achieve a unified view of its customers for optimized customer journey and customer service. In the Greater China region, one of Maserati's largest markets, the brand is working with Chinapex, a leading data technology company pioneering innovative solutions in artificial intelligence and blockchain for marketing, personalization, and CRM, to utilize cutting-edge technologies such as predictive machine learning, natural language processing (NLP), and deep learning to produce in-depth insights regarding customer satisfaction, engagement, and overall customer experience. Suite of platforms used including IQ, Chinapex's flagpship AI platform, combined with a robust integration with Salesforce and other online and offline data sources using APEX Data Connector, Chinapex's proprietary data middleware technology. Maserati has been a customer of Chinapex since 2016 with existing data-driven marketing technologies (NEXUS), but 2018 is the year new artificial intelligence cooperation has been initiated. There are also many emerging technologies at play later in the year involving Chinapex's proprietary blockchain platform APEX Network focused on the next generation of B2C applications and interactions. Upon the launch of APEX Network Testnet, a seamless integration between APEX Network and IQ will allow enriched and fully-compliant consumer data and insights to flow into IQ to further augment the value of its existing machine learning models. It would also extend the scope of consumer insights to outside of Maserati's existing client base. According to Chinapex CTO Richard Wang, "For APEX Network, consumer data-related applications is only a small portion of what's possible, but it's a minimum-friction entry point for APEX Network's enterprise ecosystem growth and adoption. We aim to optimize and bring disruptive innovation to various parts of the B2C lifecycle, including consumer experiences, B2C engagement, unified data management, and connected devices."